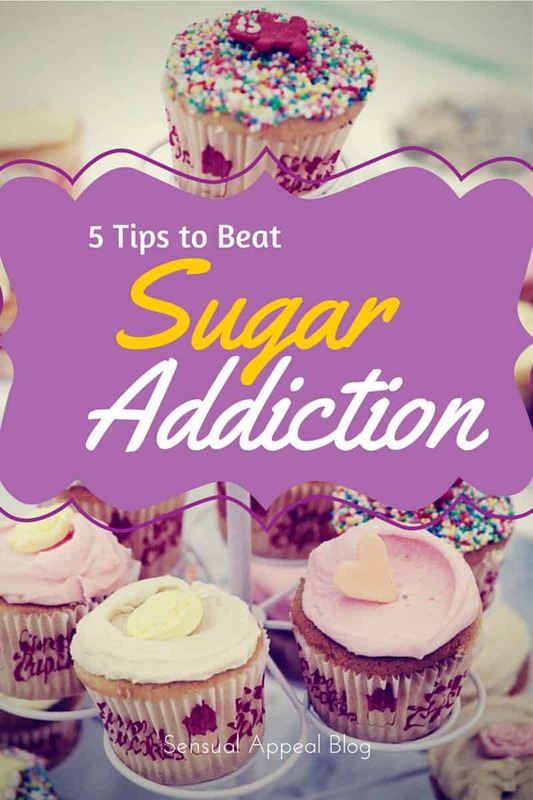 In this post, you will learn 5 great tips to helping you in how to beat sugar addiction. I absolutely love warm, gooey, extra chocolatey brownies. I also love to bake and I live alone. See the problem? I’ll bake a pan of absolutely delicious, extra chocolatey, super fudgey brownies and then proceed to devour the ENTIRE pan myself. Not exactly the healthiest of habits. I always wondered why I’m not satisfied with one brownie? Even when I’m stuffed I keep on eating. Many of my friends and clients have this same struggle. But why? It turns out that this isn’t a matter of willpower. We actually become physiologically addicted to sugar! When we eat sugar we are activating the pleasure centres of our brains to release feel good hormones. These are the same pleasure centres that are triggered by cocaine. In fact, studies have shown that sugar is 8 times as addictive as cocaine! No wonder we can’t get enough! The average American consumes a whooping 130 pounds per year, some estimates suggest it’s even more at 152 pounds! This breaks down to an average of 22 teaspoons per day for adults and 43 teaspoons per day for kids. How much should we be getting? The American Heart Association recommends a maximum of 5 teaspoons per day for women, 9 teaspoons per day for men and 3 teaspoons per day for children. What’s a gal to do when she wants to be her healthiest and happiest self but is addicted to the sweet stuff? It’s time to bring our tastebuds and physiology back into balance and get those cravings under control once and for all! 1. Watch out for Liquid Sugar. The majority of bottled beverages contain huge amounts of sugar, often way over the recommended daily intake. Soft drinks like Pepsi and Coke contain over 40g per can, Vitamin Water has 32g (not as healthy as it sounds), sports drinks contain over 35g, and fruit juices can contain as much as 35g per cup. Be wary of sweetened teas and coffees. A simple Grande Skinny Latte from Starbucks has 16g of sugar! Some drinks have as much as 87g of sugar! Yikes! What should you drink instead? Water, try infusing water with mint, cucumber, berries, lemon/ lime, or grapefruit. Herbal teas (without adding in sugar), fresh green juices and green smoothies. Remember to follow a 1:3 ratio for fruits to vegetables in your juices and smoothies to keep your blood sugar happy. 2. Fuel up with Protein and Fat. I’m talking about the healthy fats here extra virgin olive oil, coconut oil, avocado, nuts and seeds. Proteins and fats help to balance insulin levels and blood sugar levels, so that you can get off the sugar roller-coaster. Fats also leave you feeling full, while providing your cells with lots of energy. There are great protein sources for everyone. If you follow a plant based diet quinoa, broccoli, legumes, tofu/tempeh, hemp seeds, pumpkin seeds, chia seeds, sunflower seeds. If you eat animal protein opt for free-range, and hormone and antibiotic free meats. When we deprive our bodies of sleep we impact our physical and mental performance, we weaken our immune system and we put ourselves at risk for weight issues, diabetes, high blood pressure, heart disease, mental illness and many other diseases. Stress can also contribute to many of these health issues. Simple ways to de-stress throughout your day include deep breathing exercises, exercise, meditation, essential oils (Lavender), going for a massage, taking a warm bath or reading a good book. My favourite ways to get a good nights sleep include following a sleep schedule, instituting an electronic sundown an hour before bed, having a warm bath, listening to soothing music and using essential oils. 4. Become a label sleuth. Sugar hides in the most unlikely places: cereal, bread, canned soups, salad dressings, peanut butter, yogurt and even ketchup. Before tossing it into your shopping cart take a moment to read the nutrition info. Check the serving size and how many grams of sugar are in a serving. Helpful tip 1 gram of sugar is equal to 4 teaspoons. 5. Set up a Support System. Freeing yourself from sugar is a bumpy road. It’s not easy to overcome those pesky physiological signals, but it is possible! Having a coach or a buddy who is also committed to going sugar-free will dramatically boost your chances of success. The three key qualities you want in your buddy are trust, accountability and fun. You’re going to have challenging days and you’ll need someone you’re comfortable talking with and who will be able to provide motivation and encouragement. You want a buddy who you feel accountable to, someone that you don’t want to let down. Lastly, you want someone who will help keep the journey fun.